Despite various government programmes and efforts, the chronic renal disease that started from the dry zone of the country continues to take its toll on people with as many as five persons dying on a daily basis. The disease has now spread to all parts of the country barring the Western Province at the moment. The use of agrochemicals, the etiological factor of the disease, takes place unabated. Some of the banned agrochemicals are still in the market. Against this backdrop, a leading academic and lecturer of the Rajarata Medical Faculty Dr. Channa Jayasumana who did extensive research and experiments regarding the disease and its evolution, has compiled his latest book titled ‘Wakugadu Satana’ comprising all relevant information related to the epidemic. The book will be launched tomorrow at 3.30 pm at Sambudattwa Jayanthia Mandiraya, Thunmulla, Colombo. Excerpts of an interview with Dr. Jayasumana on the book, the disease and its socioeconomic impact. Q How do you analyze the origin and spread of this disease? 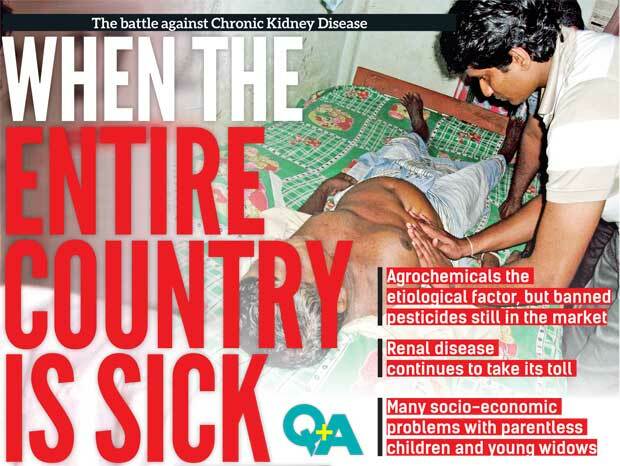 As you know, there is an epidemic of Chronic Kidney Disease in the dry zone of Sri Lanka. It was first noticed in 1994 among paddy farmers. The first patient was reported from the Padavi-Sri Pura farming colony. Usually, the chronic kidney disease occurs either due to long standing diabetes or hypertension. Here the problem is these patients do not have either diabetes or hypertension. Then, we investigated and ultimately we found this was due to some toxins. We have done the microstructure analysis using microscopes. In the renal tissues of diseased persons, we observed that the particular damage occurred in proximal tubules of the nephrones. Usually tubular damage occurs due to toxins. Then, we initiated to find out what could be the particular toxins responsible for the disease. We found certain heavy metals –Arsenic, Cadmium, chromium, Nickel, Vanadium are heavy metals, and certain pesticides residue in urine samples, hair and nail samples and renal tissues of the diseased persons. Initially, we did the analysis at the Kelaniya University. For confirmation of our findings, we took the samples to the California State University, with the help of Prof. Sarath Gunatilake. Then, we confirmed that the primary triggering factor behind this disease was toxins. Further we hypothesized that heat stress and dehydration as aggravating factors of the disease. Then, we wanted to find out the source of these toxins. The disease is confined to the North Central Province and adjacent areas. "The number of patients is increasing day by day. At least five patients die on a daily basis. For the general public, there is no source to know what is exactly happening." Interestingly, it is not found in the Northern Province. We started analyzing various environmental samples and found that soil and groundwater were contaminated with these pesticide residues and heavy metals. We concluded that agro-chemicals were the source. Next, we tried to narrow down why this much of heavy metals and illegal toxins were present in these agrochemicals. Definitely there are many substandard pesticides available in the Sri Lankan market. Although there is a law in the country and a standard set for these agrochemicals, upon analysis of samples available for farmers, we observed that each and every sample contained toxics above the specified limit. Then only, we realized that none of these agrochemicals being imported to this country was analyzed here. The Pesticides Registrar issues the licence for importation depending on the reports provided by these particular companies. They have the freedom to provide whatever report they have. What is mentioned in the report is totally different from the ground realities. Then, we published this in newspapers and peer reviewed international journals. Initially, a majority of print and electronic media institutions helped us. Gradually, we noticed some of these electronic and print media was reluctant to publish this. Journalists informed us that they could not publish because of influence from the industry. We felt the influence personally. For researches in this field, we need funds. Normally, funds come from the government because we are academics. All of a sudden, funding sources came up with excuses saying the research area was out of their scope. Then, we had to find out external sources for these studies. 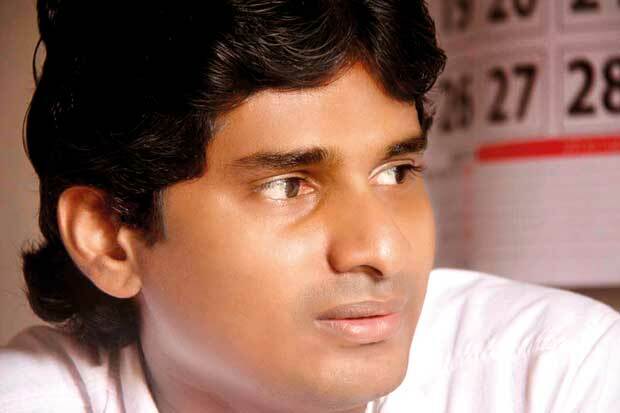 Then only, we encountered some Sri Lankans working abroad like Prof. Sarath Gunatilake. They helped us to complete the studies. At the same time, these companies followed yet another strategy to promote other hypothesis as the etiology of this disease. That is to undermine the agrochemicals as the etiological factor. They projected certain groundwater conditions such as fluoride as the etiological factor. But, fluoride was there in groundwater for thousands of years. The disease emerged only in 1990s. It is also confined to certain geographical areas. The best example is that this is not there in the Northern Province. That is because of the war we had in that part for 30 years. The security forces banned agrochemicals in these areas due to the possibility of them being used for explosives. Although geo-climatic factors are similar in the Northern Province, the disease is not found because of this factor. This is the strongest argument we have at the moment to say that agrochemicals is the factor. Q Actually, what compelled you to compile this book? For the last eight to ten years, we have been engaged in putting sociopolitical influence to bring up the issue. We have launched certain health education programmes. The previous government had to establish the Presidential Task Force for the prevention of the disease due to our influence. Unfortunately, the pressure from the industry is continuing. Certain persons involved in the agrochemical industry are representing government bodies. They are in the director boards of some institutions responsible for pesticides analysis and regulations. For example, the Industrial Technology Institute, which is the recognized body to analyze these compounds. There were various people in it. They maintain a close relationship with the industry. The reports, produced through these laboratories, were not reliable. Thereafter, the World Health Organization (WHO) conducted a separate study. They confirmed our results. They also said the disease could be caused by Arsenic, Cadmium and pesticide residues. Then, the government had to take action. The government banned several agrochemicals. Five main agrochemicals available to farmers were banned. One is Glyphosate. That was the main weedicide used in the country. Then, the second weedicide is Propanil. Chlorphyrifos was also banned. It was the most widely used insecticide in the country. The two main weedicides and the two main insecticides were banned. However, unfortunately, we still find these chemicals in the market. It means authorities are not doing their job properly. The number of patients is increasing day by day. At least five patients die on a daily basis. For the general public, there is no source to know what is exactly happening. Certain academics too mislead the community. Politicians and policy makers also do the same. At the same time, there is no good data source, even for journalists. The Health Ministry lacks a coherent and consistent data base. We had to find out these data about patients, their geographical distribution and maps, the causes of the disease and preventive measures. That is why I thought of compiling all these information into a single book for the benefit of the general public, policy makers and whoever interested. Q Now, agrochemicals are used in other parts of the world as well. Yet, the disease is found only in Sri Lanka and a few other regions of the world. Why is it? Yes, the behaviour of these agrochemicals differs from environment to environment. Especially in tropical climates, the behaviour of these agrochemicals is totally different from other set ups in the United States of America or Europe. Degradation pathways of these pesticides are totally different when exposed to high humid temperatures. In our tropical belt, there is a high possibility to retain these pesticide residues and heavy metals in soil and groundwater for a long time. There is a possibility to complex with certain compounds. It is significantly high in tropical climates. Then, there should be certain soil and ground water conditions to retain these toxins. That particular condition is there in certain places in the dry zone of Sri Lanka, India, and Central America. All are tropical countries. "The two main weedicides and the two main insecticides were banned. However, unfortunately, we still find these chemicals in the market. It means the responsible authorities are not doing their job"
At the same time, people who are living in these regions have to consume this contaminated water. In Central America, Andhra Pradesh and Orissa of India, and Sri Lanka, similar geo-climatic factors, similar magnitude of pesticide usage can be observed. In Central America, it is primarily among sugarcane cultivators and in Sri Lanka and India among rice cultivators. We can observe the similarities of the disease in these regions. If certain geo-climatic factors matches with the high use of pesticides, we can observe the disease. Also, heat stress and dehydration prevalent in the region, is an aggravating factor. Our farmers work in the fields and are subject to dehydration. Then, toxins accumulate in renal issues and damage them. That is why the disease is more prevalent among males. There is a direct exposure through their skins, respiratory systems. They are also subjected to dehydration. Concentration of toxins in renal tissues is high among males. Q What are the other factors that can support your argument in this respect? I mentioned to you the timeframe of emergence of the disease, not only in Sri Lanka but also in Central America. In both places, the use of agrochemicals in this magnitude started in the late 1970s. It might have taken at least 15 years for toxins to accumulate in the environment and bodies of people. This is more common among male farmers. In certain places, even in the disease endemic regions, people using purified water and not exposed to agricultural activities are not affected. For example, there are some spring wells in Anuradhapura. People who use water from these springs are free of the disease. That water comes from deep underground and not contaminated. In that way, there are isolated pockets. Likewise, if you go to the city areas of Anuradhapura and Polonnaruwa, people are free of the disease within the Municipal limits. That is because they too drink purified water supplied by the Water Board. We have very strong arguments to support our case. Q But, in recent years, it is said northern farmers have started using agrochemicals in a major way. How is the impact? Recently, I spoke to the doctors working in the northern peninsula. There is a trend of the disease emerging in the last couple of years. Within the next four or five years, a high number of patients can be expected. The usage of agrochemicals is even more now in the north than in other provinces. I advise and beg farmers and policy makers of the Northern Provincial Council to avoid the use of agrochemicals if they want to protect people. People in the north face graver risk than in the other provinces, because ground water conditions there are more susceptible for accumulation of toxins. The ground water is also very hard there. Whihc means a high possibility of presence of toxins. Q Now, we have observed the spread of this disease to other parts of the country even including some areas of Ratnapura. How do you analyze it? There are certain areas in the dry zone where the groundwater hardness is very high. The amount of toxins retained in the groundwater is directly proportional to the groundwater hardness and fluoride level. In the places where you observe high groundwater hardness and fluoride , more toxins remain. You observed the disease in early or mid 1990s. Then, you come to the next level. If the groundwater hardness level is in the mid range, it might have taken another five to ten years. We noticed the disease after that in places like Hingurakgoda, and Horowpotana. Now, even in places with low hardness level, patients are found. In the areas such as Wellawaya, Moneragala, Embilipitiya, you can find patients. Now, except in the Western Province, patients are found in all other eight provinces. In the Ratnapura district, we have identified some patients from the Embilipitiya and Godakawela area. In the vegetable cultivations, frequent spray of pesticides is practiced. So, growers are more exposed. Apart from the renal disease, we find young diabetics patients among vegetable growers. That is due to the direct and constant exposure to pesticides. This is the time where toxins entering human bodies through contaminated food are damaging not only kidneys but also livers. If toxins enter your body with liquid food, it will basically be damaging for your kidneys. But, if it happens through solid food items, it will be deposited in livers. Toxins are also retained in glands. It leads to cancerous diseases. That is why, we observe a high amount of breast cancer, thyroid cancer and prostate cancer. The whole area of the dry zone is affected by the kidney disease. The wet zone is facing the problem of cancers now. It is twofold horror now. The entire nation is affected due to pitfalls of the laws. The existing law was introduced in 1980. That law is not sufficient to deal with the problem. We have to introduce a new set of laws. There are five or six major companies importing these chemicals. They destroy the nation. "There are five or six major companies importing these chemicals. They destroy the nation. " Q How do you analyze the social cost of this problem? It is enormous because the whole socioeconomic structure has been affected. There are a huge number of school children with either their mothers or fathers dead due to this disease. Affected farmers die during their 30s or 40s leaving their young wives behind. Then, it caused prostitution. When they are left with no choice for making ends meet, the easiest way is prostitution. In the whole farming colonies including Dimbulagala,Medawachchiya, and Kebithigollewa, we find it. A fear psychosis has gripped people to live in the affected areas. The majority of the people in the dry zone are migrants from the wet zone at different points in contemporary history. They have relatives living in those areas. Now, these families are reluctant to keep their children with them in the affected areas. They are schooled elsewhere with the support of their relatives. Gradually, the population is decreasing in the dry zones. Nobody is willing to live there. Nobody is willing even to marry someone from the affected areas. A general phobia remains. The general perception is that this is a genetically transmitted disease though it is not so. According to Western medical standards, this disease causes irreversible damage to kidneys. What can only be managed is the further aggravation of the disease.